Here's a secret worth sharing. 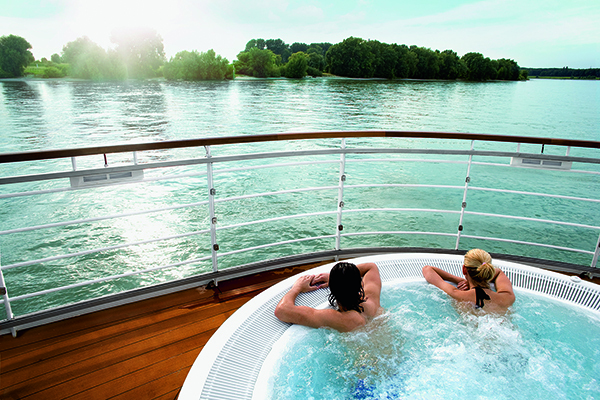 In the burgeoning river cruise market, there's a relatively unknown (at least to North Americans) German line that's quietly been providing its guests with good value and superb cruising experiences on the rivers of Europe for more than 14 years. But its anonymity is about to change. A-Rosa now is being represented in North America by David Morris International, a firm whose execs are no strangers to heading up luxury cruise lines. Among them is Executive V.P. Marilyn Conroy, who recently chatted with Hideaways about the philosophy and attractive offerings of this little-known river cruise line, which we've recently welcomed into The Hideaways Collection®. We asked Marilyn about her cruise industry background, how she became involved with A-Rosa--which sails the Rhine, Danube, and Rhône/Saône rivers of Europe--and what she finds unique about the river cruise line. "I've been in the cruise business for 30-plus years," says Marilyn in her distinctly British accent, "having started as the first-ever female V.P. at Cunard. Eventually, I was headhunted by Silversea and spent a number of years there, until about six years ago I decided I'd had enough of corporate life and wanted to go into business for myself. So I went into partnership with David Morris, also from Silversea, and we found this intriguing river cruise line that fills a niche for clientele 40 to 75 years of age who have a younger, more active mindset. We found that most lines popular with North Americans are geared toward older guests, so this was something new. "A-Rosa really was a non-entity in North America until two years ago," Marilyn continues. "They own and operate all their own vessels and have a great all-inclusive product--I'm convinced that people don't want to be nickled and dimed. A-Rosa is geared toward the upper market; I won't say luxury, because I use that term very judiciously. I also like the philosophy behind the A-Rosa name, the rose representing a passion for life. It may seem corny, but every cruise begins with each female guest being presented a rose as she comes aboard, and I love that." There are many interpretations when it comes to the term "all-inclusive," and we asked Marilyn how it applies to a cruise with A-Rosa. "First, all meals and beverages are included--not just beer and wine at lunch and dinner. If you want a Bloody Mary at 10 a.m., then fine, you should have one. All your gratuities are included, and that represents a great value. We have complimentary Wi-Fi on board and a fleet of 15 city bikes on each ship for guests' use. And finally, we offer up to €200, or about $280, in on-board credit to use for shore excursions, spa treatments, gift shop purchases, whatever you like. "We found that when all shore excursions are considered 'free,' people won't show up or are late, and that inconveniences everyone," Marilyn explains. "This way, you have the choice of using your credits for a shore excursion--maybe somewhere you've never been before--or using them for a wonderful massage, for instance. Maybe you prefer to wander around on your own or take the bicycles out for a couple of hours. It's all about choices." Since the dining experience is such an integral part of a European river cruise, we asked Marilyn how A-Rosa stacks up. "Food and wine is where I believe we really shine," she says. "We always have a sommelier on board, so essentially all our cruises are wine themed. And once again, it's all about choices. We serve breakfast, lunch, and dinner as buffets with cooking stations, with all three meals served in two-hour spans. For instance, dinner is open seating from 7-9 p.m., so you can linger in port if you like and have a later dinner. Or, you can choose to dine by reservation in our private dining room, which starts serving at 7 p.m. and offers a four-course sit-down dinner with wine pairings. "Everywhere on board, the dress code is resort casual," notes Marilyn. "Men really don't need to bring a jacket, though some do. I have noticed that women tend to dress a bit more for dinner, however. Again, your choice!" With A-Rosa's tagline of "Escape the Ordinary" and its aim to please active-minded guests, it's no surprise the line offers some on-board amenities that other river cruise lines don't. In addition to a heated swimming pool, you'll also find an expansive Spa-Rosa with an attractive relaxation area, two treatment rooms, a whirlpool on deck, and a glassed-in sauna offering panoramic views of the passing countryside. Professional trainers are on hand to work with you in the well-equipped gym, you can join yoga sessions on the sun deck, and there's a putting green, shuffleboard court, and giant chessboard to nurture a little friendly rivalry among guests. Cabins and suites are another area where you have choices, according to Marilyn. "All our cabins are light, bright, modern, and trendy, and 70 percent have a French balcony. Our standard cabin has two twins pushed together and is 156 square feet, but we've heard guests say it's so well laid out that it feels more spacious. We also have a Junior Suite with 225 square feet and a Balcony Suite with 312 square feet. There's always lots of under-bed storage, plenty of drawers, and a nice big closet. "We just launched the Flora in 2014, and it has two brand-new Family Suites that we're excited about," Marilyn continues. "These have two bunked beds on one side and the parents' bed on the other. Above all--and this may not be politically correct to say, but--I hate smoking, and you'll never smell cigarettes in any cabin, or anywhere on the ships for that matter. Smoking is only permitted on the Sun Deck, and at the very back of the ship." Marilyn sums up the A-Rosa experience by saying, "If I were to describe A-Rosa, I'd use phrases like 'young and active' and 'contemporary sophistication.' And because we're the new guys on the block in North America, we've priced ourselves very competitively. 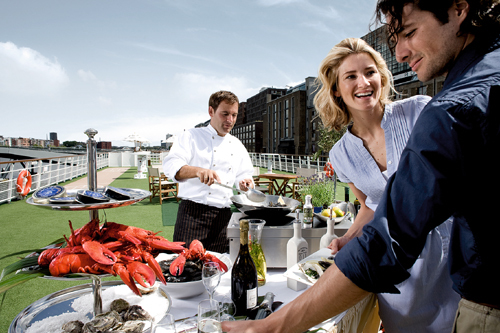 I think we're the best-kept secret in the river cruise industry right now, and the best value out there." A-Rosa currently is offering special savings and incentives for 2015, including waived single supplements on many itineraries and a "Kids Sail Free" program for children ages 2-15 (when sailing with at least one adult). You also can save $1,000 (double occupancy) when booking your 2015 cruise by December 31, 2014. Your exclusive Hideaways member perk is an additional €75 per stateroom shipboard credit. So now is a great time to give A-Rosa a try and experience something new in the world of river cruising. We hope this comparison chart helps you decide which line might be right for you. When you're ready to book your tailored-to-you river cruise experience--or if you still have questions--be sure to call Hideaways Travel Services for expert and personalized planning: 800-843-4433, or email ts@hideaways.com.